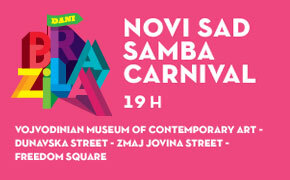 On Sunday - Novi Sad Samba Carnival! Carnival parade is the ending program of every edition of Festival Days of Brazil and this year it will be organized on Sunday, August 17th at 19.00 when participants of all workshops will gather in front of the Vojvodinian Museum of Contemporary Art and move on trough the Dunavska and Zmaj Jovina Street to the Freedom Square.... 11.August 2014. Visitors of the Festival DaniBrazila will be able to hear a Percussionists from Trieste titled Banda Berimbau who will perform on Saturday, August 16th as a part of the music program ... 6.August 2014. This year from August 15 to 17 a samba dance and Brazilian shake workshops will be held as a part of the Festival Days of Brazil – Novi Sad Samba Carnival. Leader of the samba dance workshop will be Brazilian, queen of samba drums from London School of Samba - Samara Reis. Call for participation in these workshops is now open for dancers with experience but also ones who want to learn... 9.July 2014. Watch the matches of the World Cup as you are in Rio! 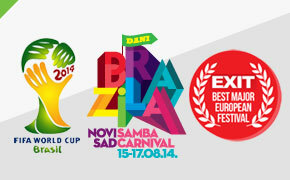 Festival Days of Brazil - Novi Sad Samba Carnival will organize for the EXIT music festival visitors screening of the World Cup matches in a true Brazilian atmosphere. With the sound of the Brazilian percussion, samba, and Capoeira we are presenting the festival "Days of Brazil Novi Sad Samba Carnival ", and together cheering for our favorites in the most important secondary thing in the world. Fun you cannot miss this summer after the World Cup and EXIT. 9.July 2014. 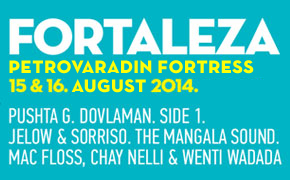 The music program on the fortress - nicknamed "Fortaleza" - will delight all lovers of Brazilian beats and more, with funk, break, drum'n'bass, dancehall... The unforgettable parting and dancing until the early hours will begin on August 15th and 16th at 22.00 with sounds from all over the world, from Serbia to UK and across Jamaica straight to Brasil!... 10.August 2014. 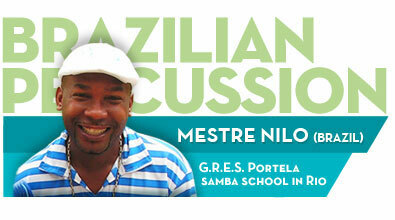 Leader of the Brazilian percussion workshop is Mestre Nilo da Portela from samba School in Rio! The Call for applications for the participation at the brasilian percussion workshop is now opened. 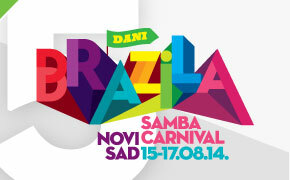 The workshops organized at medium-high and beggineners level are part of the Festival Days of Brazil – Novi Sad Samba Carnival which will be held from August 15th to 17th at Petrovaradin Fortress in Novi Sad, Serbia... 9.July.2014. 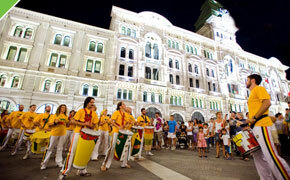 Novi Sad will be the regional center of Brazilian culture for the fifth time from 15th – 17th of August. This years festival will also consist of Capoeira, Samba dance and Brazilian percussion workshops, exhibitions, film screenings, concerts, parties and an exotic Carnival parade will attract many tourists from the region, Europe and the rest of the world. Come, enjoy and find out why Brazil is one of the most attractive destinations on the planet. We are expecting you! 15.April.2014. This year’s capoeira workshop trainer’s team of Festival Dani Brazila will be joining one more experienced capoeira trainer. In the capoeira world Alex Calixto Arruda is known as contra-mestre Lobisomem... 29.July 2014. For the participants of the Festival “Days of Brazil - Novi Sad Samba Carnival” the organizers have prepared accommodation in two best hostels in Novi Sad for the price of 12 euro per night. Both hostels are located in very centre of the city not far from all program spaces. You can reserve your accommodation on this link. 15.July.2014. With a great pleasure we are announcing the opening of the Call for applications for the free capoeira workshops, which will be organized in Novi Sad, Serbia from August 15th to 17th for the fifth time as a part of the Festival “Days of Brazil – Novi Sad Samba Carnival”. The workshops will be held under the auspice of the sport and recreation club “Capoeira Senzala” from Novi Sad but are opened for members of other capoeira groups as ... 9.July.2014. We are presenting you the amazing atmosphere of the best samba carnival in the region in our new video. Enjoy! 15.April.2014. These three-days-long workshops will be organized for adults and children. 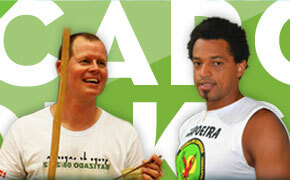 Workshop leaders will be experienced and highly valued “mestres” of capoeira. 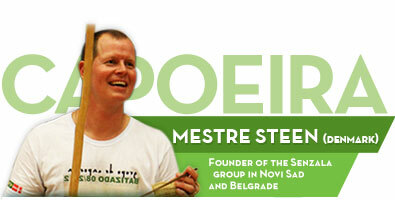 Capoeira trainings and the carnival parade which is the final event of the Festival will be led by Mestre Steen. 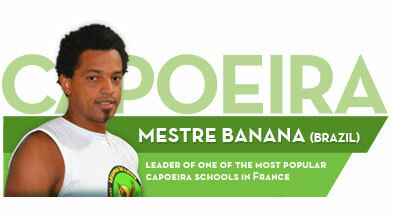 Aside from mestre Steen trainings will be running Mestre Banana Brazilian who is leading group Senzala branch in France. Trainings for children will be leading trainers form the club “Capoeira Senzala” from Novi Sad. Participants will have the opportunity to try out all aspects of capoeira: fighting, musical and acrobatic as well as different styles connected to capoeira and Brazilian culture (maculele – dance with sticks…). Mestre Steen is the only master of capoeira in the Senzala group that is non-Brazilian origin. He is founder and leader of the Capoeira skolen Senzala (founded in 1991). He is a specialist in Afro-Brazilian music and movement. As a professional capoeira practitioner, dancer and musician, he has more than 20 years of experience as a highly trained artist, leader and teacher in and outside of Denmark. He also has many years of experience organizing large international capoeira festivals. In 2001 under his auspice were founded capoeira clubs in Belgrade and Novi Sad. Claudio Marsio da Silva or Mestre Banana last year has received the master belt and is one of the youngest masters in the world of capoeira. He started doing capoeira in 1992, at his age of 14, in Teresopolis, Brasil, with Mestre Elias (Escola de Capoeira Grupo Senzala). In 1999, he moved to France and today, Marcio provides more than eight classes per week in the town of St. Germain en Laye and has nearly 180 students. His work has grown and expanded to other cities of Yvelines (Chatou, The Vésinet TRIEL on seines, Mantes la Jolie) and Hauts de Seines (Gennevilliers). He has organized several international meetings and festivals. In the capoeira world Alex Calixto Arruda is known as contra-mestre Lobisomem. He gained the rank of contra mestre in 2012 in Rio de Janeiro where he was born. For almost 12 years he has been teaching capoeira and successfully giving trainings for children and adults. 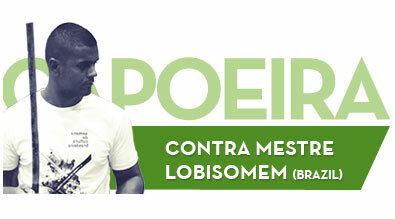 Lobisomem is a 32 year old trainer, percussionist who has been practicing capoeira since he was 10 years old. Last year and a half he is living in Podgorica and working under the auspice of Associação Barra Pulmão - MestrePulmao, Rio de Janeiro and Center for Brazilian culture in Belgrade. The capoeira workshops are, as other programs at this Festival free of charge, but the application trough the web site www.danibrazila.org is necessary. 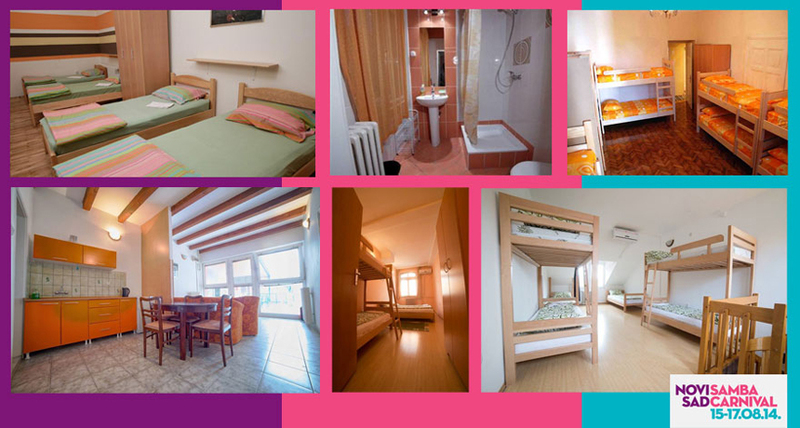 The accommodation will be organized under the fair prices at the very center of the city. Detailed information on accommodation will be announced at the mentioned official Festival web site. All participants who apply, upon their arrival will receive an info pack with detailed instruction how to get to the Festival. The traveling expenses will be self-covered by participants. If visa is needed, organizers can send invitation letters and other support documents. All the necessary informations will be posted very soon. 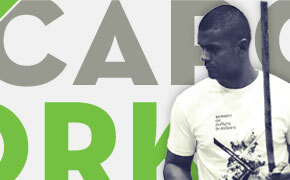 Application for capoeira workshops can be done via this link. After your application the program organizers will be contacting you for further instructions and information. Leader of the Brazilian percussion workshop is Mestre Nilo da Portela from the samba School in Rio! The Call for applications for the participation at the brasilian percussion workshop is now opened. The workshops organized at medium-high and beggineners level are part of the Festival Days of Brazil – Novi Sad Samba Carnival which will be held from August 15th to 17th at Petrovaradin Fortress in Novi Sad, Serbia. Aside from learning new tecnichues, exchanging expiriences and socialising the workshop goal is to prepare for the participation at the carnival parade which traddicionaly closes the Festival. This year the workshop for medium-high level will be leading Mestre Nilo one of the best mestres from Rio school of samba “Portela“ and Augusto Rego from Portela too. Atila Kovac, percussionist form the Novi Sad school of percussions Sambansa will be the leader of the workshops for begginers level. The brazillian percussion workshops are organized as a three day long intensive course of samba percussions, going trough various rhythms and preparing for the final performances ssuring and at the end of the Carnival parade. On the first day participants will practice playing technique and on the last two days one or compositions that will be performed (Samba de Enredo). Mestre Nilo Sergio Santana is from Rio and is 34 years old. He got into the world of samba percussions trough the Bloco Boemios de Iraja school of samba. In the house of Mestre Fuleiro, which he visited oftenly he saw how Beto "Sem braco" plays samba on the box of matches. In 1990 trough Mestre Faisca he started playing in the Imperio Serrano school of samba and the very next year in 1991 he made his debute in the G.R.E.S. Portela school. For the first time he started to play caixa, surdo de primeira and surdo de terciera when the school leader was Mestre Timbo. In 2003 Mestre Carlinhos Catanha invited him to take part in the directing board of the oldes samba group Portela, for as the fallowing year he became conductor of the Portela bateria and in the first year got the title of "revelacao." Today Mestre Nilo stands for one of the best mestres of Rio samba schools. For times he was selected as the best conductor of samba bateria. His style is innovative and full of energy. Attila Kovacs started to play samba in 2008, in the school of samba percussion “Sambansa” in Subotica. Soon he fell in love with brazilian rhythms and in 2011 he became a member of an international samba bateria Bloco X, wich gathers more then 200 members the best players from each country from more then 20 countries of the world. He is one of the leaders - mestres of bateria Bloco Coracao-regional samba association, gathering the samba schools from east Europe. Also he is one of the leaders of “Sambansa” school. The Brazilian percussion workshops are, as other programs at this Festival free of charge, but the application trough the web site www.danibrazila.org is necessary. The accommodation will be organized under the fair prices at the very center of the city. Detailed information on accommodation will be announced at the mentioned official Festival web site. 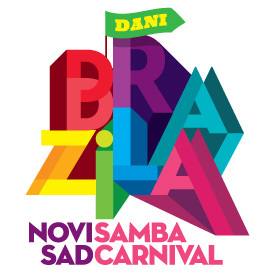 This year from August 15 to 17 a samba dance and Brazilian shake workshops will be held as a part of the Festival Days of Brazil – Novi Sad Samba Carnival. Leader of the samba dance workshop will be Brazilian, queen of samba drums from London School of Samba- Samara Reis. Call for participation in these workshops is now open for dancers with experience but also ones who want to learn. 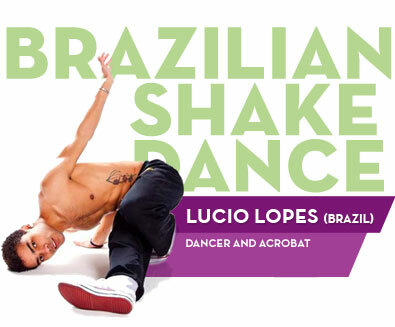 Lucio Lopes, dancer and acrobat will lead the workshop of Brazilian shake, his own mix of different Brazilian dance styles and who impressed the participants of his workshop last year. The results of the workshops will be shown in public on the last day of the festival when the carnival parade will go through the center of Novi Sad. The workshops will be held in the ballroom of dance school “Alegro” (address: Kisačka Street no. 3). The Samba dance workshops will be free of charge and open for all dance lovers apart from the experience and age. The workshop leader will be Samara Reis from London School of Samba who will also be the leading dancer of the carnival parade on the last Festival day – August 17th. Aside from samba dance workshops participants will also have the opportunity to take part in 'Brazilian Shake' workshops who will be led by charismatic dancer, acrobat and capuerist Lucio Lopes. Come to have fun and move our hips with Brazilian melodies. Samara Reis, originally from Sao Paulo, she had early training in Brazilian partner dance (Samba-Rock, Lambada, Forro, Gafieira, Pagode Paulista, Bolero) and has formed a personal approach to samba, with a focus on elegance and good posture. A celebrated Passista, she gained her expertise performing with Sao Paulo's Vai-Vai Samba School, in 2003 was voted Rainha da Bateria of the London School of Samba and in 2008 was nominated the Rainha da Bateria for Coburg International Samba Festival. Currently based in London, Samara has been teaching workshops and choreographing around London. Her Samba career included highlights of performing for Will Smith on the Ant and Dec Show, NME Awards 2009, Fringe Festival 2010 and 2012 with BRASIL BRASIL Show, the BRIT AWARDS 2011, and appearances in television shows, promotional work and many advertisements such as L'oreal, Samsumg, Sony, Pringles and Vogue. Samara teaches Samba all over England and Europe and she is also Zumba qualified. Lucio Lopes, capoeirist, acrobat, and dancer from Brazil. Began practicing capoeira at the age of 10, and entered the dancing world at the age of 17. Worked in Brazil as capoeira trainer and instructor of Brazilian dances, as well as a vocalist and dancer of the group ‘Predadores Kachorroes’. Came to Europe in 2012 with the aim of expanding his work in capoeira and dance. Participated and lead several workshops of capoeira and dance in several European countries such as Hungary, Serbia, Croatia, Austria, and Russia. Dance festivals where he has been participating are: Kizomba Budapest Connection 2012 and 2013, Budapest KizzMe Festival 2012, Budapest Salsa Festival 2014, Salsa Split Nigths Silvester 2013, Dani Brazila Novi Sad 2013. 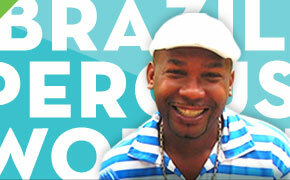 His main dance styles are: Funk Carioca, Samba, Axe. Lucio makes a fusion of all these dances into his own style he likes to call ‘Brazilian Shake’. The Samba dance workshops are, as other programs at this Festival free of charge, but the application trough the web site www.danibrazila.org is necessary. The accommodation will be organized under the fair prices at the very center of the city. Detailed information on accommodation will be announced at the mentioned official Festival web site. Application for samba dance workshops can be done via this link. Fun you cannot miss this summer after the World Cup and EXIT. You can reserve your accommodation on this link. This year’s capoeira workshop trainer’s team of Festival Dani Brazila will be joining one more experienced capoeira trainer. Visitors of the Festival DaniBrazila will be able to hear a Percussionists from Trieste titled Banda Berimbau who will perform on Saturday, August 16th as a part of the music program FestaBrasiliera in the Cultural center of Novi Sad summer cinema. 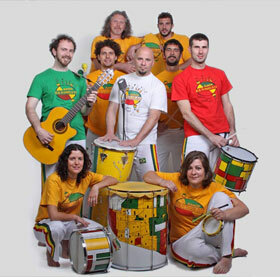 Banda Berimbau is a Brazilian percussion group composed of musicians from various Italian regions and foreign countries. Formed in 1999, the group is based in the city of Trieste and it's the most important group in Italy for this kind of music. With hundreds of live shows in different kinds of events in Europe, South America and the Middle East this gang leaves no one indifferent. The music program on the fortress - nicknamed "Fortaleza" - will delight all lovers of Brazilian beats and more, with funk, break, drum'n'bass, dancehall... The unforgettable parting and dancing until the early hours will begin on August 15th and 16th at 22.00 with sounds from all over the world, from Serbia to UK and across Jamaica straight to Brasil! This late night spectacle in such a special environment is a guaranteed good time recipe for all the people who love clubbing parties under the open sky. Vladimir Simić from Novi Sad has been active in music since the year 2000 as a member of a hip-hop duo Besna Braća, while in the last 5 years he's been actively involved in DJ-ing. 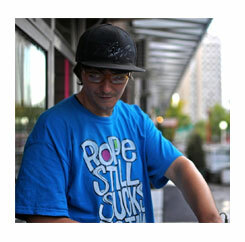 He often considers himself a freestyle DJ, and in dance selection he mostly refers to genres such as: funk, hip-hop, soul, disco, reggae, funky breaks, and nu disco. 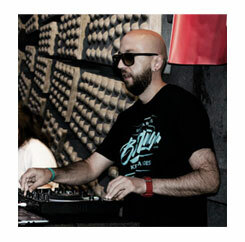 He is also a member of funky breaks DJs association, by the name of Adriatic Funk League. This year he is performing at prestigious music festivals Exit and Sea Dance, as well as all Open Air Live radio stream parties organised by Watch More TV Radio. Dovlaman a.k.a. Vladimir Vučković is a DJ who in all conditions and trends has been contributing to club and media scene of Novi Sad for over a decade. He performed as a resident at Novi Sad clubs and many club events and festivals in the region. Dovlaman's set includes commercial and underground musical genres such as funky breaks, hip-hop, electro, disco, house, bass, breakbeat... likeable, danceable, full of surprises and sudden twists. Drum n bass DJ, promoter and producer from Belgrade. One quarter of All That Bass crew. 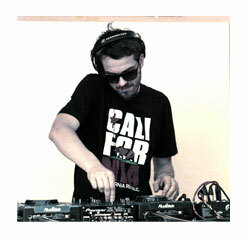 He's been DJ-ing for over ten years, and besides many performances in the region and Serbia, including Exit and Outlook festivals, he has also shared decks with many famous names of drum n bass scene (DJ Marky, LTJ Bukem, Fabio, Bryan Gee, Adam F, Bungle, EZ Rollers, Danny Byrd, A.I., Drumagick, 4Hero, DJ Vadim...). In 2007, together with Rahmani, Necone and Rašid, he starts the most successful drum n bass series of parties in Belgrade as a part of which the most popular names of the world drum n bass scene have been presented to Belgrade audience. Jelow and Sorriso are a Novi Sad duo which has been together behind a mix deck more and more often over the last 5 years, which has been proven as a great recipe for a great party. The two of them are back to Days of Brazil this year as well. 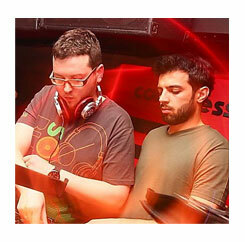 They are famous for their drum n bass, liquid funk and jungle sets. For two years they have been producing Drumology Radio Show, a show dedicated to drum n bass culture, which is broadcasted on Radio Nula. The energy that comes from this long term cooperation, different interests and in some way contrasts between these two artists can be noticed only at their performances. 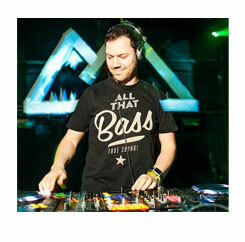 Vladimir Popović aka Government 4000 is one of the leading men of the global bass movement in Eastern Europe. He often uses Brazilian Baile Funk combined with Balkan rhythms just to move you. Advanced thinking and inventiveness of this new subgenre are intertwined with traditional culture. More than anything, this new musical landscape is full of colour, fun and is constantly evolving. The Mangala Sound crew is made under the leadership of this experienced DJ, and within its ranks it has a number of soldiers that complete the audio picture at performances here and abroad. The geographical and generation gap between these three artists hasn't influenced their unity on stage. In his career the experienced Jamaican Wenti Wadada has collaborated with the greatest reggae performers from all over the world, and with his texts and appearance he really quickly achieves communication with the audience. Mac Floss as a DJ with a lot of performances also publishes his own original music with which he takes an important position at the British dancehall scene. The young Briton of African origin Chay Nelli other than with exceptional poetical and voice features also contributes to this group of performers with her moves that follow the performance from the beginning to the end. Carnival parade is the ending program of every edition of Festival Days of Brazil and this year it will be organized on Sunday, August 17th at 19.00 when participants of all workshops will gather in front of the Vojvodinian Museum of Contemporary Art and move on trough the Dunavska and Zmaj Jovina Street to the Freedom Square. Participants of this international carnival parade will be samba percussion players, samba dancers and acrobats, little and big capueirists who will surely draw attention of every visitor or passerby. Come to have fun in Brazilian way - trough the event that you can't miss this summer!